Twelve, 12 oz. hand-crafted beers each month selected from the world's best international breweries. You'll get two different beer styles, six of each style. Our Monthly Newsletter with detailed tasting notes, beer profiles, brewery histories, and suggested food pairings. 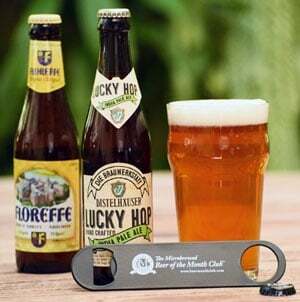 FREE bartender's bottle opener with all orders of 3 shipments or more. For those most interested in exploring beers crafted abroad, our International Beer Club is the answer. Focused solely on imported beers, this club delivers uncommon brews from countries outside the U.S. representing both the cutting edge of the craft beer renaissance overseas as well as traditional styles brewed at their source – often from breweries several hundred years old in such famed brewing countries as Germany, Belgium, and England. You or your gift recipient will enjoy such styles as Czech Pilsners, English Pale Ales, German Bocks, Scotch Ales, Belgian Abbey Ales, Irish Dry Stouts, Vienna Lagers, Hefeweizens, Witbiers, Barleywines, and many more! Club members will also receive our Malt of the Earth newsletter in each shipment, which offers brewery histories, robust tasting notes, food pairing recommendations, beer specifications, and more. Each featured international beer is imported to the U.S. especially for our members, who are also able to re-order any of their favorite selections while supplies last! Our Beer Selection Process is the key to consistently delivering quality craft beers and what sets us apart from the rest. Here’s how we do it. Our experience ranges from judging at the Great American Beer Festival to heading brewing operations at BJ’s Brewhouse, a 100+ location brewpub chain. We’re knowledgeable and passionate about beer and we’ve got your back. We rate over 500 beers each year on appearance, aromatic profile, body and balance, mouthfeel, finish, and of course, its overall character, flavor and appeal. Less than 20% of all beers we rate make the final cut. Our panel keeps busy attending, judging and submitting beers at prestigious festivals, creating collaborative beers with other microbreweries, meeting with brewers and importers, and most importantly, trying new beers. Our 20+ year relationships with breweries and importers is critical to discovering outstanding new beers while they’re still hard to find. We help them launch new products and you get to try them first. Many beers are brewed exclusively for our club members and not available outside the club. We pay special attention to seasonal beers such as Dopplebocks, Bavarian Hefeweizens, Oktoberfests, and Spiced Winter Ales made in small production batches and brewed only once a year. …getting a new shipment delivered every month is like Christmas morning 12 times a year. For over 20 years now, we’ve offered memorable beer gifts perfect for the beer lovers in your life. With a beer club membership, your gift will be appreciated long after the first shipment arrives! It’s Not Just Beer – It’s a Beer Experience! Our goal is to make each beer gift membership a true “experience” gift: Excellent craft beers curated by our expert tasting panel, brewer profiles & brewery histories, detailed tasting notes from our tasting panel, recommended food pairings & glassware, and much more. Exploring the world of beer with our members has been our passion since 1994, and we can’t wait to share the fun of discovering great new beers with your gift recipients in the months to come! Need a Last Minute Solution? – Send a Gift Announcement! During checkout, you’ll have the option to schedule an email gift announcement for any date you choose, or create a PDF that you can print out and give to your gift recipient. It’s the perfect solution for those of you who are in panic mode! Just order your beer gift membership to start with the next available shipment, and email or print a gift announcement now! We take our 100% Satisfaction Guarantee seriously, and take pride offering responsive, care-driven customer service. So, sit back, relax, and let us handle everything. No searching stores, no waiting in lines, no wrapping boxes, no crowds – Let us do the work for you, delivering smiles to your gift recipient month after month! During checkout, you can customize a Gift Announcement to send today, or schedule one for a later date. If purchasing an Open-ended Membership, you agree that your subscription will continue and your credit card will be charged with each shipment until cancellation, which you may do any time by calling 800.625.8238. How often should shipments be delivered? Is this a new membership? Delivery Schedules - Shipments should arrive towards the last week of the month via a carrier in your region*. Gift Announcements may be emailed or printed at any time. *NOTE: Due to unique challenges required to deliver beer and wine in certain regions, occasionally the first shipment of a membership can take an additional 1-2 weeks to arrive depending on when your order was placed. Please call our Customer Service Department at 800-625-8238 for an estimated time of arrival for your delivery area. Shipping Restrictions - We cannot ship beer to Alabama, Alaska, Hawaii, Kentucky, Mississippi, and Utah, nor outside of the US. Shipping Location - Shipments require an adult signature upon delivery, so choose a location where an adult can sign for delivery. Shipping Alcoholic Beverages - By placing an order with us, you authorize us to act on your behalf to engage a common carrier to deliver your order and that you and the recipient are both at least 21 years old. After more than 20 years as the President of The Microbrewed Beer of the Month Club™, I’m as passionate about beer as I was when we started. And I’d like to share that passion for exploration and discovery with you.